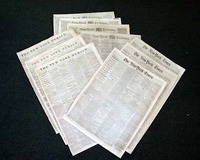 A lot of 47 damaged Civil War newspapers, most of which are the "Boston Daily Journal" although there are some other titles mixed in. An interesting & sizable lot all during the Civil War and all containing some Civil War content. 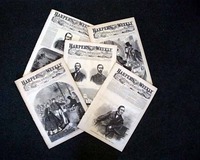 CIVIL WAR A lot of 5 issues; all issues contain inside or back page Civil War maps. A great way to obtain CW maps for a reasonable price. The images shown are representative of the look and condition of those you will receive. Actual dates vary. 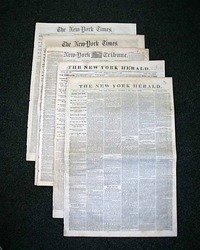 CIVIL WAR A lot of 10 issues, all New York titles (NY Times, NY Herald, and/or NY Tribune), and all with inside Civil War coverage. The images shown are representative of the look and condition of those you will receive. Actual dates vary. 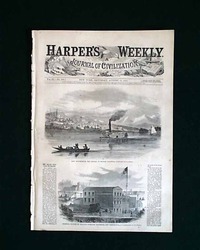 CIVIL WAR A lot of 10 issues, all from major U.S. cites (New York, Philadelphia, etc. ), and all in 2nd rate condition, but with no loss. A great bargain priced lot of issues if 1st rate issues are not needed. 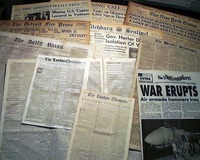 The CIVIL WAR: a lot of 10 issues all non-New York titles from during the Civil War and all have war reports. 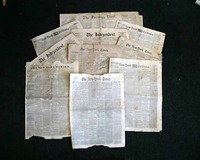 A great set for a reseller or for someone looking to obtain authentic Civil War newspapers at a discounted price, and all are in average or better condition. 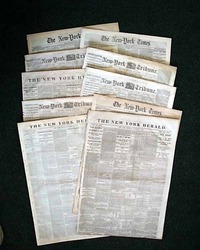 NEW YORK TIMES, 1865-1866 A lot of five issues of the New York Times from just after the Civil War, each with a report of a baseball game. 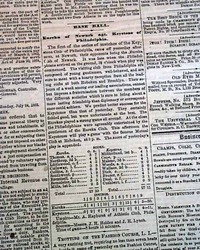 These issues provide a mid-19th century perspective of America’s favorite pastime. Some browning, generally nice condition. 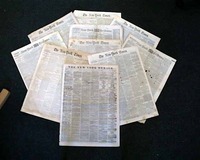 NEW YORK TRIBUNE and TIMES, a lot of six issues of July, August & September, 1865, each containing on inside or back pages a report of a baseball game with box scores. Very early baseball from shortly after the Civil War. All are complete in 8 pages, nice condition. CIVIL WAR - A lot of 10 issues, all from either a major U.S. city (New York, Philadelphia, etc.) or combination thereof, and all with some damage. 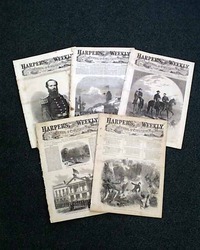 Great issues for reselling or for reading authentic and original Civil War reporting... and at a great price.